Wow, these things sill have a phone port after all these years. Our 1st world high tech forefront advanced future-proofed $50 billion NBN still using back the ancient copper network bought off Telstra hand. NBN FTTC still using the old phone port as outlet. I find it hilarious that in the manual you linked they couldn't even get the diagram labeling the active led from the surge protection led correct. 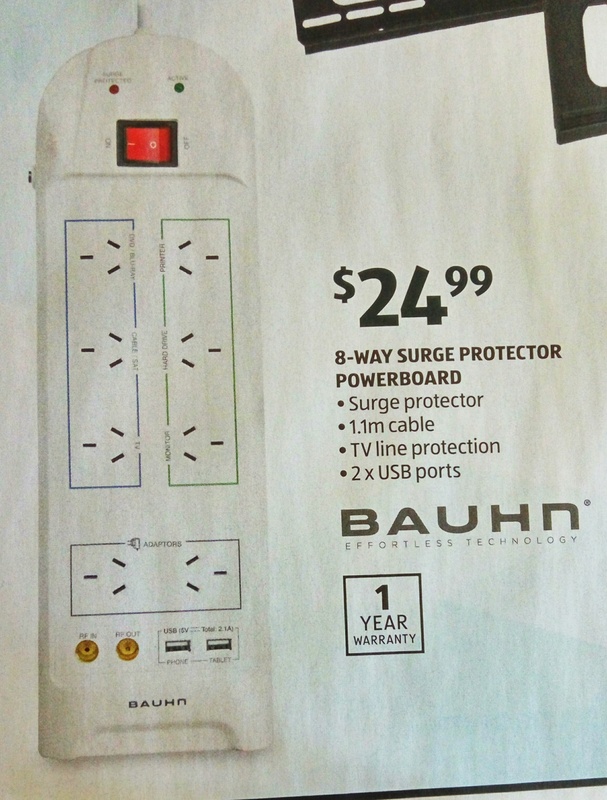 Not sure if I trust their ability to design a power board now :p.
It will be some generic chinese catalogue product with a logo slapped on it and in turn their design is probably stolen from a contract manufacture job they did in the 90s for a brand name product (and thus the phone jack). I got one of these from 2 years back. Watts so special about it? Buy this and swap for old one and it will be bauhn again. But will it transform anything? @newdad: Keep working on those dad jokes, newdad. I keep mistaken this brand for Braun. I think that's the general idea with that name. Anything else in the dogalogue? I glanced through it in store - I remember seeing large built-in kitchen appliances such as ovens, cook tops, dish washer, …, Women's fitness clothing and some big TVs. Unfortunately I didn't take a copy with me because I usually get a copy delivered with the rest of the junk mail that comes on the weekend. go to their web-site. They publish an on-line version of the catalogue. You can even sign-up with email reminders of their one-off specials from the catalogue (their catalogues come out a week and a half in advance making it easy to forget the specials imho). PS the Aldi app also has the catalogue too with a push notification setup available for the specials..
the printed catalogue always comes out before they put everything on the website. these work ok but for the 2 i bought at half price $12.50 they seeem to buzz ~_~"
I've bought one of these almost exactly a year ago. They work really well with one specific issue I've noticed. The built in USB ports have a tendency to 'hum' electrically after a period of time - when someone is plugged in and drawing power. If you're the person who can hear high pitched electrical noise this may be an issue - if you don't.. then no issues. Because this board isn't where I sleep it doesn't bother me at all.. but it does when I'm in the same room!. The 'buzz' that Calmerancer mentioned was specific to the USB ports - it didn't buzz at all for me otherwise.